An experimental model of the Geunjeongjeon Hall created in 1:100 scale by Professsor Jeon’s team. 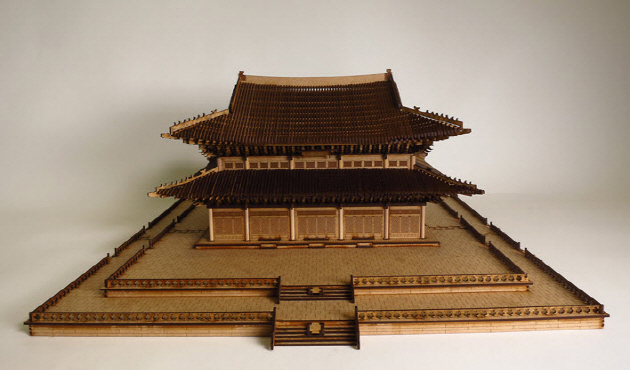 Professor Bong Hee Jeon of the Department of Architecture and Architectural Engineering and his research team created an experimental model of the Geunjeongjeon Hall in Gyeongbokgung in 1:100 scale. What sets this model apart from previous ones is that it replicates the design principles and construction techniques of Korean traditional wooden architecture. The method used in this construction also applies to the wooden architecture of Japan and China, which share the same post-lintel architectural design principles. The uniqueness of this Korean traditional architectural technique is the fact that nails are rarely used to fasten individual components, meaning adhesives are not required, and it is possible to assemble and disassemble the components repeatedly, allowing a builder to modify structures repeatedly. This type of construction model can be commercialized as toy construction sets similar to Lego, the popular Danish toy loved by children all around the world. Such a product would serve educational purposes such as developing spatial awareness in children and teaching them about the construction principles of Korean traditional wooden architecture. Geunjeongjeon Hall employs a number of complex traditional architectural principles. Using a 3D modeling program, the research team analysed the joint-and-splice wooden structure of the hall. For the model, the team created and used a total of 3,537 individual units, which were initially designed in 2D, cut with a laser-cutting machine, and finally assembled by hand. The research team plans to create a video of the entire manufacturing process of this model and use it in educating about Korean traditional wooden architecture.